I am an executive coach, one who helps executives find and develop a clear brand message which they are then able to articulate internally as well as externally. I do this through many guises, I am the chapter president for Professional Speakers Australia but am most well known for being the curator and licensee for TEDxMelbourne which I have been doing for the last eight years. I would guess that I have heard thousands of talks and presentations over the years. If you are operating in the event space, you are always looking at speakers and listening to ideas. It could be a speech on the top 10 influencers in Melbourne or it could be a speech about what I have read in the newspaper or seen on TV. Ideas don’t live in one space, they live all over the place. My role as curator is to discover and then re-share those ideas. Over time you see changes in the way that speeches are given. Obviously, in terms of topic, there are always going to be trends. With the current trends including women, youth, diversity, equality and A.I robotics. Some trends are fleeting, whilst others last for longer periods of time which is probably true for the topics of women and youth which have been around for a few years. If you asked me in a year’s time what the trends are, we could see something completely different. Underneath the shift in topics, there is the essence of all great communication which is the clarity that a speaker needs to have around what it is that they stand for. Whether that is a message on stage, the message conveyed by a business or an individual searching for their ‘purpose’ in life. I have found that those who I consider remarkable are always very clear about who they are and what they stand for, their message is clear. Take the classic example of Martin Luther King and his message of having a dream, JFK and his message of man on the moon or Nike and the message of just do it. The common feature of all these messages are they are very simple and very clear messages which are arguably timeless. I am a big fan of principle-based thinking, if an idea or message aligns with a principle then I know personally that I will give it a lot more of my time. I appreciate that somebody has thought about that idea or message to the extent that it is as simple as it can go, but no simpler. If a concept is not clear in your own head, how can you then expect to convey it to someone else and have them understand it. I originally did a business degree in I.T. Not because I had a particular interest in technology, although I do like gadgets, but because of my strong interest in change. I.T was and probably still is the space that changes the most often. Whether it is human change, industry change or technology change I enjoy the transformation and the interjectory of all those things and the relationships between those factors as they come together. This is also the origin of TED as well, TED began as the culmination of three original principles of technology, entertainment and design. In that sense, the work that I did pre-TED and the work I do at TED are based in principle. I began in the I.T world as an analyst but what I spent a lot of time doing back then was Y2K, which was effectively the change of the dates of computers as they moved into the 2000’s. You could tell a computer to take 1999 and subtract from it 1997 in order to determine that 2 years had passed, but if you then told a computer to take from a year ending in 000’s there were huge repercussions. Whilst it may sound as simple as formatting of a date on a document or in a calendar, there were further repercussions for automated dated records and for real-time events. There were two schools of thought around whether this was just a whole lot of hype or whether it was a real problem that technology was facing for the first time. I was at the front and center of it all and it was as real as it could be, I was working 120 hours a week non-stop. I was offered an unlimited cheque to sit in a server room of a bank in London, an offer which I refused because that was not the reason why I was there or who I am. The story underlying all of this was the reason it happened, people in the industry knew that the problem would arise at least two or three decades before it did, it was because of engineers speaking tech speak to senior executives who did not understand technology. You have to remember that this was a time when there was no such thing as a CIO or CTO, there wasn’t even a direct path by which a technology person could speak to a senior executive. These engineers could not convey a message which in reality should have been very simple. One of my core skills and the reasons for my involvement in the solution was my ability to be to do just this. It amounted into 12 years of work in order to get the solution over the line. When TED came along, it was the same core problem. It was a matter of working out how I could help researchers, scientists or philanthropists to simplify their life’s work into a speech lasting only 18 minutes or less. I was not the original TEDxMelbourne Curator, actually a friend of a friend was. In 2009 she was faced with the decision of whether she would organize the next TEDxMelbourne conference, or her own wedding. From this decision I inherited the role by accident, with a mail list of only 53 people, most of whom I knew myself. These people went on to become my tribe; people who shared a common interest in the future, in change, in principle and those who were open to the exploration that their world view might not be the only one that is valid. This created a great environment for new ideas, for the cross-pollination of ideas and collaboration. Everything which is great about TED is probably just as valid in the modern world, particularly in the entrepreneur world. TEDx is no longer just about events, it has gone through some amazing transformations along the way. Most people don’t realise that TED actually began in 1984, the first set of TED videos were made available only for the event attendees by means of laser disc. To get into a TED event, which is still true of today, it costs between $80,000-$120,000 per ticket for no other reason than the amount of interest around it and the value of the experience provided. The TED events are like no other event that you will ever go to. If you have achieved just one thing in your life, you can qualify to attend a TED event as there is a qualification process. The brains, the ideas and the comradery in that room create a space which is like no other, hence the reason why such extraordinary content is created out of this. In 2005 TED made the decision to give its content away for free, via the internet which is pretty radical in itself. If you paid $120,000.00 for a piece of information and TED then decides to make that piece of information available for free on the internet, that is pretty remarkable. What is even more remarkable was that TED did this around the same time or even slightly before the time of Youtube. As you can imagine back then they had a market size close to 0 of people who just watched videos on the internet, let alone TED videos. Moving into 2009 TED made the decision to grant free license to people around the world to develop and hold TED-like conferences which allowed them to use their IP and brand. Some 8 years later and I still have that TEDxMelbourne licence and they still trust me with it. These days their approach to quantifying the value that I create is much more technical, anyone who understands NPS will get a sense of that. I need to be within a certain global percentage of a Net Promoter Score (NPS), this increases every year and so in turn I have to lift my game every year. We have now reached a point where we have a tribe that have watched the TED.com website over a billion times. I have an independent licence, that is what the ‘x’ part of TEDxMelbourne signifies. Whilst I am not TED, I have a licence to use the TED name, brand and to create TED like experiences in Melbourne. At our next event on September 19 we are expecting some 1300 people with the theme of ‘Rebels, Revoluntionaries and us’. It is all around edge thinking, what causes somebody to be a rebel or to think in a revolutionary way and then how we relate to this. You often find that those people who are put on a pedestal and who are labelled a ‘rebel’, don’t understand themselves what all the hype is about. Usually they are people who have been doing the very same thing for decades, it is just suddenly that what they are doing has become topical and it is because of the attention that they are labelled ‘rebels’, for doing or thinking the same things they have for many years. For them it is simply what they do. This also opens up the idea of what it is that makes an idea or something revolutionary. Sometimes it can just be a small thing done over and over again for a long period of time which causes the revolution. It doesn’t have to be a gamechanger like Facebook or Uber turning up out of nowhere. It is actually companies like these who are the rare birds, in the tech world they are nicknamed ‘Unicorns’. Yet some people thing this is what innovation and entrepreneurship is, you need to remember that these are the exceptions and not the rule. Good old entrepreneurship is about getting your nose bloody, your hands dirty and still coming out the other side. People always ask me how I have been able to make our chapter more successful than others, the truth is it comes down to the fact that I have been willing to make more mistakes than other people and have still managed to come out the other side. Sometimes it is just one piece of information that just hits you between the eyes, but these pieces of information aren’t very common. It is usually a combination of a whole bunch of small things that make you realise the impact that something is having or isn’t having on your life. I decided one day that I should document all the time that I spend in a week researching and studying myself. During the peak, I worked out that I was spending 20 hours a week. It could be any topic and in any area, I just pick a topic, work out what I need my outcomes to be, work out what my milestones will be and then I keep studying to the point where I am no longer learning anything new. This doesn’t necessarily mean reading everything, in some areas I may have had a head start in my knowledge or my knowledge may have already peaked before it plateaued. This doesn’t mean that it won’t go further, for example if you look at NLP’s (Neuro Linguistic Programming) which in my view has had three major turning points in its history but at the moment it has plateaued, there is nothing much more to learn about it at this point in time. However, I find that every 3-5 year period that something new happens with NLP’s so I will go back to researching and learning what is new about them. You just have to find out the rhythm or pattern in the area of knowledge that you are interested in and understand how it changes. For example, I.T changes every few months, for biology the core biology won’t change as humans have been the same for thousands of years but our understanding of that core biology is accelerating. It might be a change every ten years, every five years, every two years or every 12 months, it is important to understand the rhythm. One of the principles of psychics is for any given atom to understand what it is doing, you need to know where it starts and which direction it is going. If you do not understand those two principles, then you are not able to understand anything else about that atom. It is the same with information, you need to know where it is at and you need to know where it is going. If you do enough sample rates, you can then work out the rate of that change. By knowing the rate of that change you can know how much you need to dip in or dip out to continue to study it. For me, it is the culmination of when certain things converge that are of particular interest. What we have at the moment is convergences of an environment that is at a precipice, we have an economy which is heading towards burnout and on top of that politics which has become childlike. We have a government which is under great stress, as is the political system more broadly, regardless of which side of politics you fall. It is the first time in history that not only are these things all being disrupted but they are also then massively impacting each other in very dramatic ways. That is the bit that it is interesting to me, it is the super scale that is interesting not the what is Trump doing today as opposed to last week. It is the culmination of those patterns and trajectories that I study. I think you have a better chance of predicting the probability of the future and the rate of change if you understand the core principles that are effecting the environment, in terms of the political and economic environment. I used to treat all change the same, until I heard the quote that ‘there are only two types of change; cyclical change and structural change’. Cyclical change is kind of like the weather or fashion in that you know that it is going to come back, a lot of people fear cyclical change because of its returning nature. Then there is structural change which is that which fundamentally changes the world in which we live, things like motor vehicles, the internet, universities or universal healthcare. These are things that even at a small scale if applied to lots of people simultaneously, dramatically change the wellbeing of the humanity that are influenced by that. Classic examples of this include vaccinations or sanitation. The UN is always focused on the structural change, the things that they should focus on for the next 30 years and commit their resources to. If you get sucked into what is happening with Trump this year, the one thing we know for sure is in 8 years he won’t be there. In some respects, I like the fact that Trump is in power because he is putting things on the table in a way that no one else would and is forcing anyone who would otherwise be sitting on their hands to express an opinion, it stops people from sitting on the fence. Good vigorous communication is the domain of any great idea. TED is the modern-day renaissance of what would have been the bohemian days back then, when there were the cafes and coffee shops where the intellectuals would come together and talk about their ideas together. TED is just a digital version of that, it is the conversion of a range of expertise from around the world interacting in a way which we haven’t seen before. I am lucky enough to be at the crossroad of that, to be able to see it both incoming and outgoing and to then be able to explore those changes with people in a good old fashioned vigorous conversational way. It is not about having the same opinion but being able to recognise that somebody can take the same information, analyse it and develop a differing but well-founded opinion and you can respect each other’s differing opinions. It is about finding the conversation pieces which allow us to understand each other and to even understand ourselves. This has an extraordinary impact on the quality of the relationships that you can then have with other people and also with yourself. Clarity is so important in terms of who you are, what you stand for, where you spend your time and who your friends are. The greater the clarity the faster you will get where you want to go, everything else must be secondary to that. Clarity is probably the easiest thing to say but quite possibly the hardest thing to do. Some people call it flow, mindfulness or zen instead of clarity, there are a whole bunch of words but it comes down to how you find your stillness or what lights you up. The classic analogy of this is you are in the middle of the ocean and you can’t see land as you can only see 40 foot waves. If someone on the other side of that wave dropped the Empire State Building, would you necessarily notice that wave? If that ocean was like glass, still as, and someone dropped the empire state building in it would you notice? The answer being of course you would notice. It is the stillness that creates the clarity. It doesn’t mean you have to sit on a mountain meditating for the rest of your life. Some people get their flow from playing sport, listening to music, dancing, singing or playing with their kids. When you get into that flow, you are 100% present and when you are 100% present it becomes 100% clear as to what is important to you and what isn’t. It is also a great opportunity to reflect whilst in that state, it becomes easy to understand what is important now, it doesn’t mean that it won’t be important tomorrow or the day after. But if you do the most important thing now for the rest of your life, that is where you will get the extraordinary outcomes during common hours as you are singularly focused on doing the most important thing first. I think it was Washington who used to have these intense hours, he would pick a day where he would only focus on the single most important project and he would spend his entire day doing this. The habit I guess is around having a practice of finding stillness and of clarity about that one thing. Create time for those intense hours, for me it is usually three hours on a Monday afternoon and about 95% of the time I hit that. I spend those three hours focused solely on the most important project for that week, month or year whilst being free from distractions such as phones or emails. I am an analog type of guy, I like to smash out an idea on a piece of paper and work through what the project looks like, what the order needs to be and what I want the outcomes to be. I break every element down and then put it into a schedule so that I know when I get up in the morning if I haven’t done one thing, I can then spend my intense hours on that one thing. It is about building the habit of practice, of doing that one thing over and over again to the best of your ability week after week. There are many clever quotes, a lot of them seem to originate from Einstein such as the one about judging a fish by its ability to climb trees. My default quote though which consistently remains true for me is the quote by Thoreau ‘if one advances confidently in the direction of his dream, and endeavours to live the life which he has imagined, he will meet with a success unexpected in common hours’. The interesting part of this is the idea of doing it confidently, you might know or you might not know, you might get it right or you might not get it right. There is a lot to be said around the power of focus and concentration. I think it was Bill Gates who when asked the one skill that someone would need in life in order to achieve, said the one skill would be focus. One of the things I have spent the last 10 to 15 years doing is unless something aligns with my core principles 100%, not 99%, then I will not do it anymore. I have become much more comfortable in saying no to things that do not completely align with them, even when it is something that I really want to do. You only get a certain number of hours in a day, there are only a certain number of things that you can concentrate on and unless you focus on the only thing that is important to you, you will always get distracted by the things that you “should” be doing. That lack of clarity is the one thing that will undo every talk, every single business and every single family. If there is not unity in the direction you are headed, if only takes one degree of difference to make a big difference 10 or 20 years down the track. There are lots of great books which are great for many different reasons. 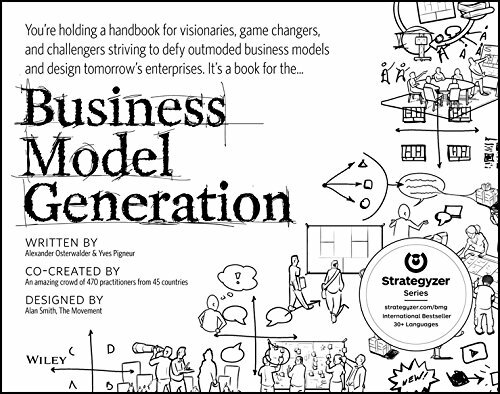 However, the book that I would recommend to the listeners would be The Business Model Generation by Alexander Osterwalder and Yves Pigneur. It is a great book which allows you to clarify what your business is about, what you stand for, who your target audience is, how you ultimately serve that audience and how you do this in the best way. It is the current book that I would recommend if I were to put my entrepreneur hat on. For anyone who is interested all the information around dates, times and speakers can be found at tedxmelbourne.com. Some of the topics and themes that we will be exploring at our next event are things like what does it mean to be in the mind of a rebel and how do they think differently from us? What causes a revolutionary to think the way that they do and what makes something revolutionary? There are of course the topical issues you would expect such as A.I and its impact on how we will live, work and consider ourselves as human beings in the future. Computers can do all of the repetitive and logical stuff, the one thing that computers cannot do is all of the creative and magical stuff. There are theories around that by the time children currently in grade three graduate, they will all be working in jobs where they use a decision-making robot in some way, shape or form. In some ways we already do this, take for example your GPS or Siri which are decision making robots, it’s just that it will be universal. We are also going to be talking about things which are a bit more Australian centric, the silliness around Melbourne vs Sydney and the battle between state and federal. The regions which are most successful are those that are able to get over themselves and to work together or collaborate in order to achieve something. I am talking like New York and Boston or Beijing and Shanghai hyper regions. Australia does not have a hyper region which is a massive competitive disadvantage moving into the digital age. We also have some more psychological and science based topics, we have something for people of all disciplines. The easiest way to get in contact with me is on LinkedIn, just search Jon Yeo TEDxMelbourne. I do have one request though, I get hundreds and hundreds of connection requests from people I have never heard of so I you want to connect meaningfully please just put a note. I want to have meaningful engagements and I want to have meaningful communications. Even if you don’t know why you want to connect but you think something could arise in the future, just put that in the note. I get hundreds and hundreds of applications each year for people wanting to speak at TEDx, many of them try to connect with me through LinkedIn and I just think to myself that there is a line. If you have a TED talk, great I’d love to hear from you but you are best to go to the TEDx website and use the application form as if you email me, this is where I am going to refer you to anyway. If you give me some context as to why you are wanting to connect, then we can connect in a more meaningful way.